User interface: 4/5. It has a clear layout and smooth transitions. It has a varied usage of colors and animations. There aren’t very many menus and no instructions are needed in order to understand the app. It’s easy to understand how to move through the app. User experience: 3/5. 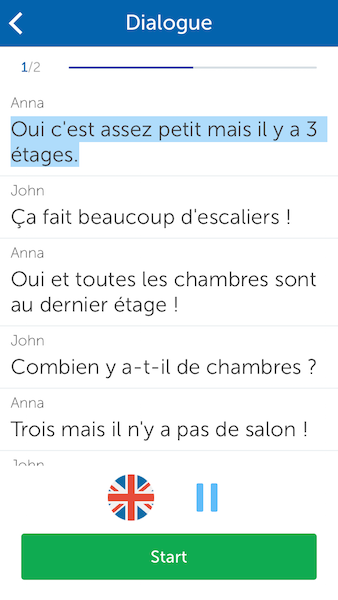 One part of the app is dialogs, where you hear a conversation. After the conversation, you are asked to fill in the blanks from the conversation using vocabulary words. It's great to hear these words used in context, but the dialogs are too fast. 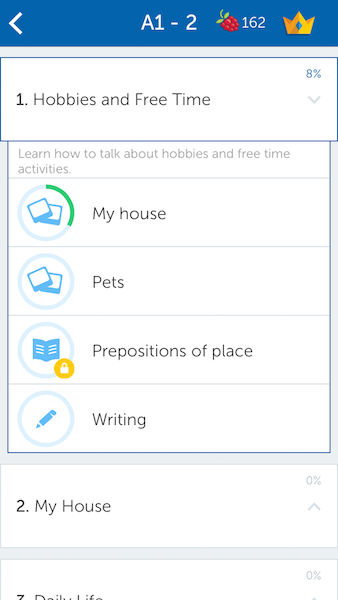 The app doesn’t give you enough exercises and time to learn new content. It feels rushed because you are quizzed on words you’ve only seen once or twice. The ability to have your writing graded adds a personal element, since you get feedback from a native speaker. There are some annoying full screen ads. Learning: 3/5. Exercises are separated into four levels: beginner A1, elementary A2, intermediate B1 and upper intermediate B2. This structure helps you move from simple to advanced topics. In each lesson you learn vocabulary through reading and listening, then you are quizzed. There is too little practice for new vocabulary because you only see the meanings a few times before the quizzes. 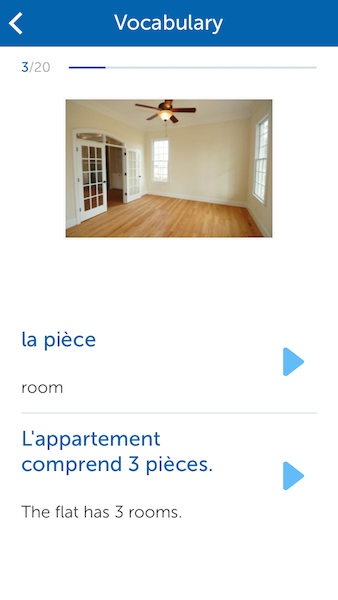 The dialogs are helpful for seeing new vocabulary and grammar in use, but the quizzes are not helpful because they mostly test how well you memorized the dialog. The writing exercises could be very helpful. You write a few sentences in response to a question. A native speaker can grade this, but there is no guarantee that someone will look at it. Motivation: 4/5. You get busuu-berries for completing activities. They could encourage you to keep going. Positive feedback from reviewers can also be encouraging. Feedback: 4/5. When you get questions right or wrong there is visual and audio feedback. Answers are green if they’re right and red if they’re wrong. The audio ping is different if the answer is right or wrong. You can’t review topics with which you had difficulty. I'm a student at Northwestern University majoring in computer engineering and minoring in German. I'm interested in studying the usage of mobile applications for learning.